Oat pancakes are one of my favourite things at the moment, mainly because they're so cheap to make (especially if you use rolled oats as opposed to shop-bought oat flour). 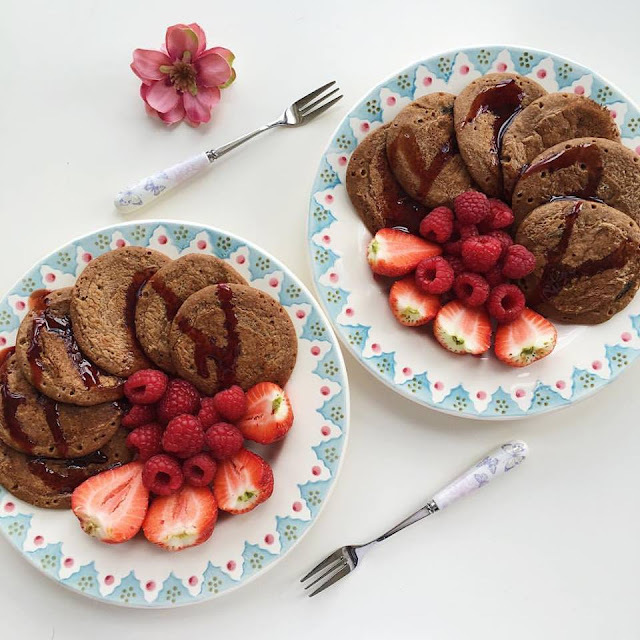 The flavour of oat flour is much more mellow than buckwheat flour so this recipe is a good starting point for someone who is used to traditional pancakes. I've made regular oat pancakes and chocolate oat pancakes (recipe coming soon!) but this cinnamon-raisin version is by far my favourite. The banana in this recipe gives the pancakes plenty of sweetness but I love adding coconut sugar too because I have a huge sweet tooth and adore the extra dimension of flavour it adds! You can substitute the coconut sugar for the same amount of liquid sweetener or other type of sugar; alternatively you can use stevia to taste or just leave out all additional sweeteners completely. Place the oats in a high speed blender and blend them on high for about 30 seconds until you get a flour. Then add the banana, coconut sugar, cinnamon and non-dairy milk and blend again until a smooth mixture is formed. Stir in the raisins. Heat a frying pan over a medium heat - I have a non-stick frying pan so I don't use any oil but you may need to use something like coconut oil if your pan isn't non-stick. When it's ready pour about 1/4 cup of the batter for each pancake into the pan. You'll probably be able to fit three or four pancakes in at once which means less cooking time (yay!). Let the pancakes cook for a minute or two, until bubbles start forming on the top, then flip them over and cook them for another 30 seconds or so. Repeat with the rest of the mixture, then add your toppings and enjoy! Add the oat flour, coconut sugar, cinnamon, non-dairy milk and raisins into a large bowl and mix them together until a smooth mixture is formed. Mash the banana and stir it into the rest of the mixture. I love anything cinnamon raisin! This stack of pancakes is so beautiful too! I suffer from Anorexia and I'm having hard time at the moment, especially when it comes to portion sizes. So I was wondering if all your pancake recipes serve one person?